To maintain the privacy of the network, we can only provide you with the screenshot of each link. The metrics are verified at the time of BST approval which are verified by mods. The change in metrics at a later date is not in our control. We try our best to complete the order within 20 days. Verified aged domains - average age 6 years, unique IP's, low OBL's, av DA30. Average amount of domains referring on the site were 186 and the average TF was 12 so within acceptable tolerances. Verified advertised backlinks from authority sites. Good communication from seller. Thanks for the approval, Apricot! We are offering ten 40% discounted review copies. If you're interested kindly post below and we will send you the coupon via PM. I received a two post review copy. Websites had some time taken to make them look good. Social media buttons, social media pages, fake ads added, multiple pages, defaults changed, comment sections, backgrounds, logos, etc. Everything you would expect from a great looking PBN was done, no complaints there. Both posts were on domains with at least 100 referring domains according to Majestic. I checked some of the back links and the domains had links from sites like Wikipedia and Scientific American. The back link profiles were good. Limited spam, strong contextual links in the back link profile. My two posts were well written. They had multiple images and were done on a thin topic. Not a lot of content exists about the KWs I provided but OP made it work, which was impressive. Sites had some posts without links and held up to a sniff test. Content varies in length so it does not look like a 500 word blog network. Number of words and images vary. 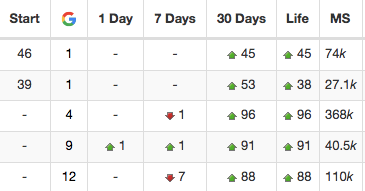 I can't speak to SERP increases because it was only two posts. But my KW peaked at 9 and was at 11 previously. Still shifting after the posts came in. All in all, good stuff here. This is a service I would DEFINITELY recommend because of the quality, cost and the ease of use. I sent my keywords and URL then I got my posts a few days later! Very well built sites, each of them has a custom logo, about, contact, and privacy pages and a Facebook page which make these blogs looks real. These sites have unique IP's, Clean, Good navigation, and nice looking themes - Beautiful! Articles are well written, good, unique (2 x 450 words), Copyscape-passed and contain two images each post. This is an EXCELLENT SERVICE. Recommended. 9 more 40% off coupons remaining. Post below to claim it now! Received a two-post review as well. For PBN's, these sites were extremely high quality, as were the DA, PA, and trust flow. The domains were aged nicely, and there was nothing at all that screamed to me that the sites were connected in any way. I received two articles with one link on each article for my chosen keyword. My topic was not a very easy one, but OP managed to deliver a high-quality article that, while the content was somewhat cookie cutter, the grammar flowed extremely well. I'm very impressed, especially with the turnaround time on this (five days) and the number of reviews that were being offered at the same time. 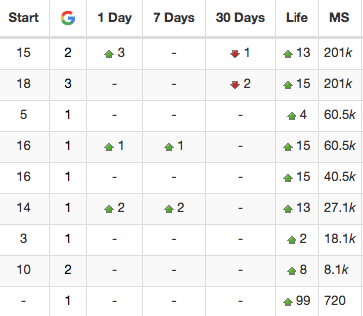 I've already seen a minimal increase in search engine position as well. The site had been dormant for a few weeks before, so I can only assume that the bump was from the posts/backlinks offered by OP's service. 1) Both sites have a Facebook plugin showing only one like on each page. If a social media plugin is going to be front and center on the sidebar, I would have liked to see some likes/activity on it. Overall, 9/10 for content, timeliness, customer service, quality. Good stuff. I received a review copy of this service from OP - I was provided with links on two separate domains to my site. Content on the sites is very good - it reads well. Domains look solid as well. All in all looks like a nice service. I want to get a discount code but I will use it 1-2 month later, possible OP? I got a new site but still in building model, so I need some time ummmm. Please send me the coupon! Also, how long will the posts stay on the homepage? How long will this network stay up for? Any replacement if sites are deindexed? Are you going to be adding more sites to the network? The posts will stay on homepage for 3 weeks atleast. The network should be live for next 3-5 years atleast. Yes we will replace the links on deindexed sites if any with the new ones. 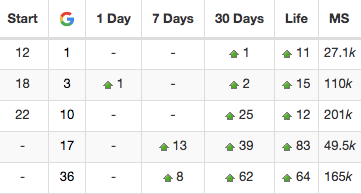 Yes we are adding 8-10 domains every week. Order for 15 posts placed. Last 4 trans: 0804. Using brand name as KW to homepage. Will report results in a few weeks. I am also interested...pm me the coupon code...also wanted to know as in are the backlinks going to stay on homepage or they will shift to next page. Transaction id 661Y. Good luck for your sales. Please send me a discount code.